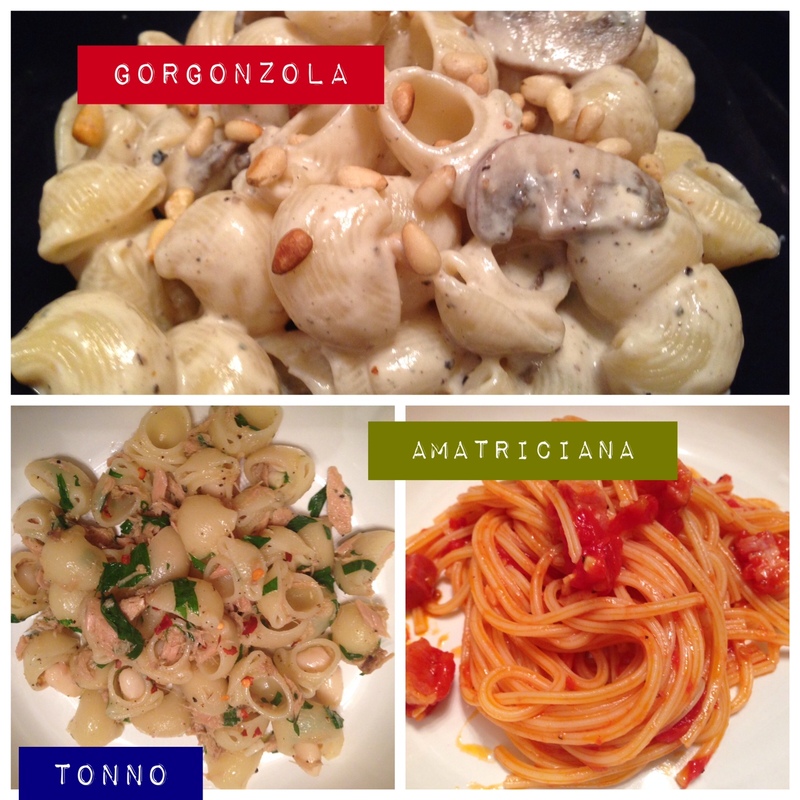 You are here: Home » Three pasta dishes that take 20 minutes or less! Three pasta dishes that take 20 minutes or less! Let’s face it, everyone is always complaining how there isn’t enough time in the day, including me! When we arrive home we are tired, the kids are cranky and hungry, the dog needs to be walked, the laundry won’t wash itself, and after a bit that Chinese delivery food is looking like a reallllly good option. Don’t give in! Here are three pasta dishes that are flavorful, quick, easy, require only a handful of ingredients, and are even appealing to the most finicky eaters. 1. The first pasta dish is spaghetti all’amatriciana. This dish hails from Amatrice (hence the name) in the Lazio region of Italy and is a popular Italian dish that is eaten all over Italy. Traditionally it is a tomato based sauce flavored with guanciale which are cured pork jowls. I did tell you this was an easy recipe so rest assured that pancetta can easily be substituted for guanciale. This is what I normally use. Bring your salted water to a boil and cook the pasta al dente. While you are waiting for the water to boil and the pasta to cook heat a pan over medium heat and brown the cubes of pancetta. Remove pancetta with a slotted spoon and cook garlic in the pancetta oil, being careful not to burn the garlic. You might want to lower the heat a bit before you add the garlic. Cook garlic for about one minute and then add the tomatoes. When adding the tomatoes, use your hands to crush/squeeze/mutilate them while adding them to the pan. Also add some of canned tomato juice. Add the pancetta back in the pan, season with salt, pepper, red pepper flakes, and simmer over medium heat for about 10-12 minutes or until the sauce has thickened up a bit. Drain pasta, toss with sauce, add grated cheese on top, and enjoy! 2. The next pasta sauce I’ve featured on my blog before but it’s a sauce that I often forget about and whenever I do make it, it’s such a treat! I found a new pasta shape–pipe rigate–and it’s such a great shape because it holds creamy or chunky meat sauces (bolognese) so well. Whole Foods is now carrying it in their new organic pasta line. If you can’t find it in your local grocer you can also use orrecchiete, macheroni, or penne. This pasta dish is pipe rigate with a gorgonzola cream sauce with mushrooms and toasted pine nuts. You can find the recipe here. On the original recipe I didn’t add the toasted pine nuts, but I think they add a nice texture and dimension to the sauce so if you have them, use ’em! Also, if you don’t have porcini mushrooms, don’t sweat it! I used sliced baby bella mushrooms this time and the result was just as good. Make sure to season with loads of black pepper and plate and serve immediately! 3. For the third pasta dish I used the same box of pipe rigate and made them with canned Italian tuna from Genova, cannellini beans, garlic, and parsley. I told you I’d keep it simple! Bring your salted water to a boil and cook pasta until al dente. While pasta is boiling, heat some evoo over medium heat and saute garlic for about one minute. Add the can of tuna (with the oil) and mix with garlic. Season with just a little salt and pepper. Add the cannellini beans for the last-minute or so (you don’t want them to become mushy). Drain the pasta, mix the sauce and pasta with some more oil, add the parsley, and top off with the red pepper flakes. Try one of these three pasta dishes on a weeknight and I can assure you your family will thank you (and so will your wallet)! I love a quick and easy to make meal. Thanks! Me too! Hope you try one of these dishes!